This is the post that I’m hoping will *change your life*. It has mine. Yesterday I turned two family packages of raw (skinless/boneless) chicken breasts into 8 portions of frozen seasoned and shredded chicken ready to add to almost any recipe. I have a real thing about working with raw chicken. I hate it. Hate the feel of it. Hate the risk of contamination. Hate cleaning up after it. I also hate frying it and adding it to a meal, never seems to taste as tender and flavourful as I’d like. So I found this recipe on how to prepare your raw chicken breasts so that you can turn it into shredded chicken using your crock pot, then just pop out of freezer and into sauce or whatever you are making for dinner. Total brilliance. Visit the link above, or have a look at how I prepared mine. Today I’ve pulled out a ziploc bag of shredded chicken and am adding it to my Curry in a Hurry recipe: dinner done and it’s only 1:35pm. Sweet. Remove raw chicken breasts from packages and trim off any of those fatty, “googly” bits as I call them. Bleh, gross. Layer chicken breasts in crock pot and sprinkle some salt on each layer. Add the garlic & onion powders to the water and a bit more salt, then pour over the chicken. Set crock pot to low, and leave for about 6 hours. This will depend on your crock pot – mine was done after 5 hours, so perhaps prepare this during the day instead of at night. Once the chicken is cooked and starting to really fall apart, remove with slotted spoon to a cutting board and continue to shred with a knife. Then portion the cooked shredded chicken into meal sizes: we managed to get 8 ziplocs out of these 2 packages. You can then freeze these individual portions and remove as needed, and add to your favourite sauce or casserole recipe. For more ideas, here is a link to a whole mess of shredded chicken recipes. Forty to be exact. See? Life changing I tell you…life changing! Andrea….so excited to try this today as raw chicken is so gross and this will save so much time! Thank you! Ditto on the raw chicken disgusting-ness. I hate it. I make my husband clean and bag it for freezing. Gag!!!! This sounds so easy, though, and i’ve seen a couple recipes lately for shredded chicken sliders, etc. I think they’d be good for a Super Bowl party or other gathering. Thanks for the tip on this. I’m definitely going to try it. I am convinced this is a female aversion…to raw chicken. I bet we’re not the only ones to get our husband to do the dirty work with cutting and storing raw chicken! 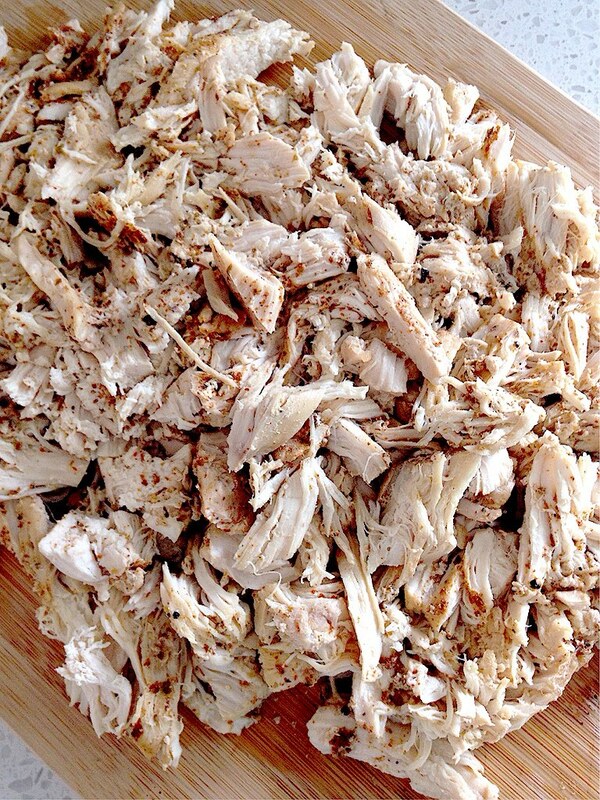 Hope you had a chance to make the shredded chicken – would love to know how you used it! Doing a big ol’ pot of this tonight–it’s going to be shredded chicken week! So have you used your new stash of shredded chicken yet?